I made this because this past summer I found the 29-Day Giving Challenge and started a group on their site called 29Cards. 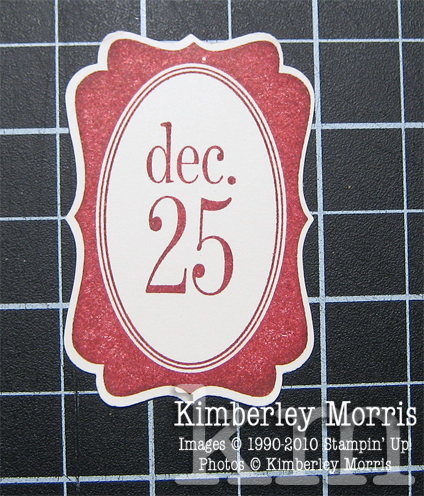 I asked and received permission from Stampin' Up! 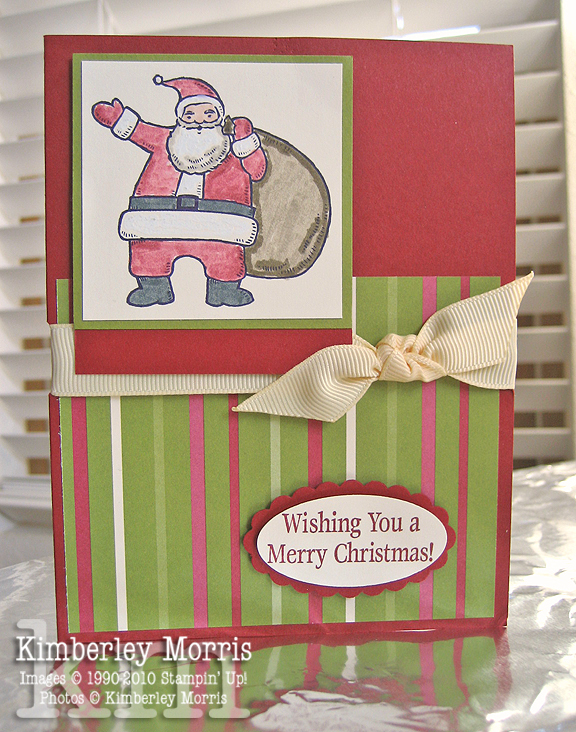 to make My Digital Studio® cards specifically for members of that group to print and give away. So, if you'd like to use the Thank You card above, you can find it HERE, just scroll down after reading the terms. There's also a Happy New Year card that I made, which I struggled and struggled with...and I'm not sure I'm a big fan of it, but it gets the job done. You'll find a printable copy of this card on the same 29Cards Group message thread. Okay, here ya go...three more holiday cards! 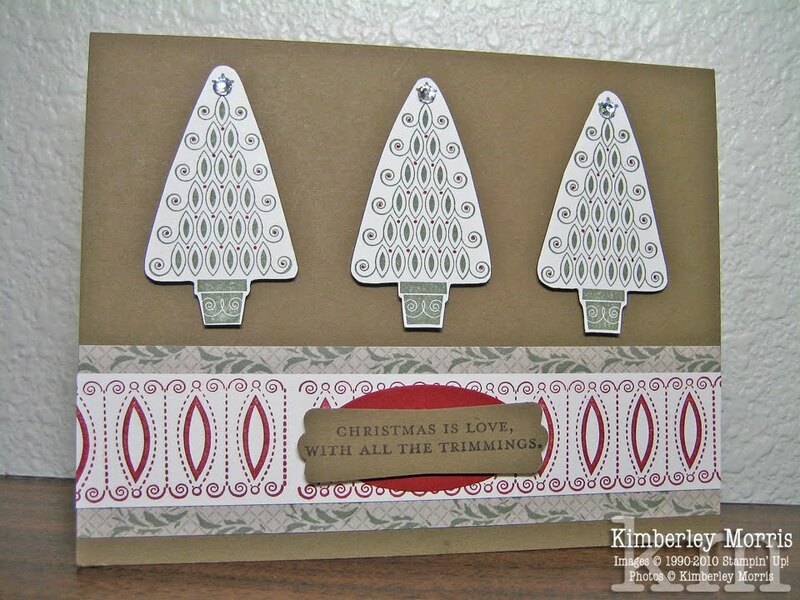 These three cards feature the Contempo Christmas stamp set. The one at the bottom uses Iridescent Ice embossing powder over the entire tree layer. Sorry, I can't seem to get my lighting to work for optimal photos lately. I'll work on that! Just email me with any questions you might have on the supplies I've used. 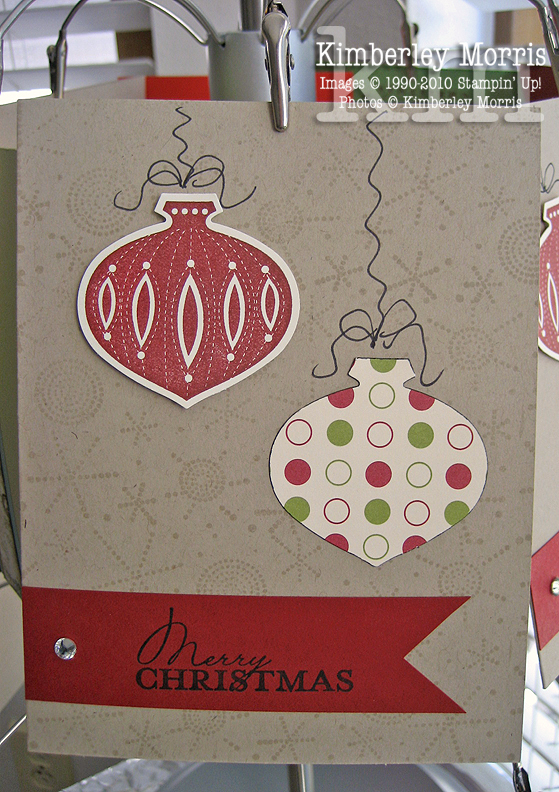 The Designer Series Paper on the cards is Deck the Halls (on the first two cards) and Jolly Holiday (on the last card). 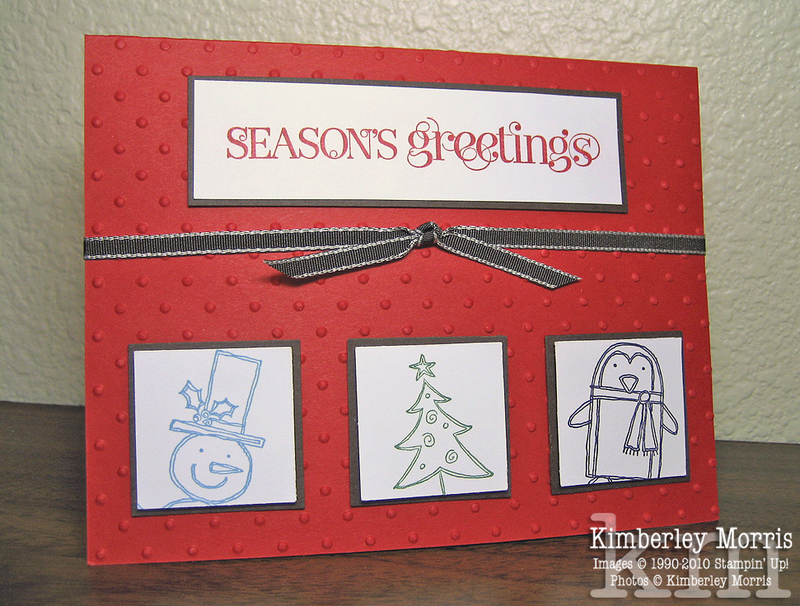 Designer Series Paper makes for super fast holiday card-making! And, if you don't have time to make holiday cards, consider stocking up to make Valentine cards to catch up with loved ones after the holidays. 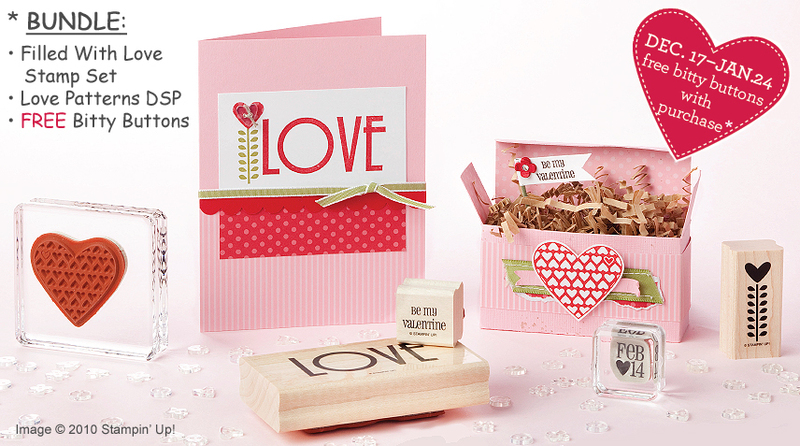 Check out the Filled With Love promotion for some exclusive Designer Series Paper, and FREE Bitty Buttons! First, you can get the Love Patterns Designer Series Paper (shown below), which is available ONLY through this promotion! 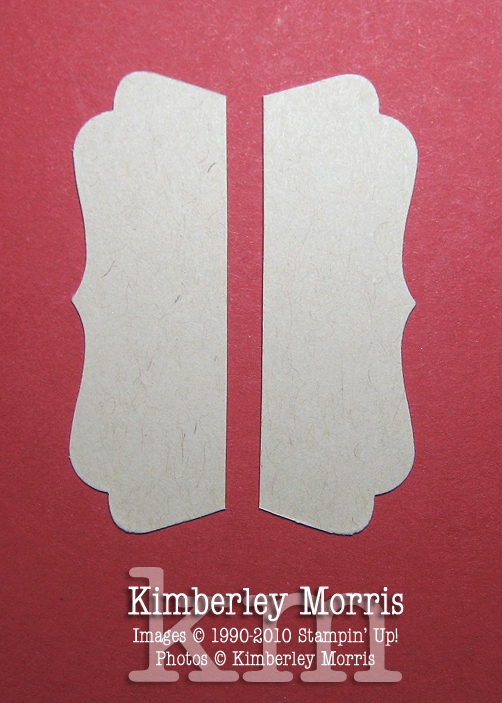 There are 12 sheets of 12"x12" double-sided patterned paper total, three sets of four designs in Real Red and Pretty in Pink. 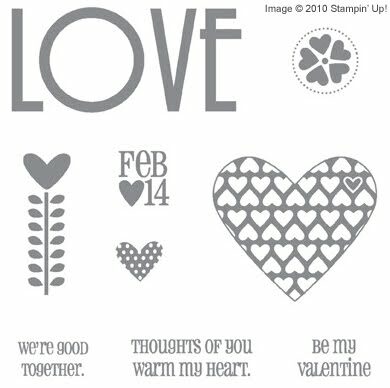 What I love about this paper pack is that the designs are simple geometric patterns you can use on any project, before, during, or after Valentine's day. Second, you can get a package of Bitty Buttons (shown below) FREE when you order one of the Filled With Love bundles. (choose wood or clear mount, in English, French or Spanish). These clear buttons are about 1/2" in diameter, and the shapes coordinate with the Itty Bitty Shapes Punch Pack, and the Itty Bitty Bits stamp set! So, you can punch, or stamp and then punch, attach to the images to the back of the buttons, and you'll see the images through the clear front of the buttons...so adorable. 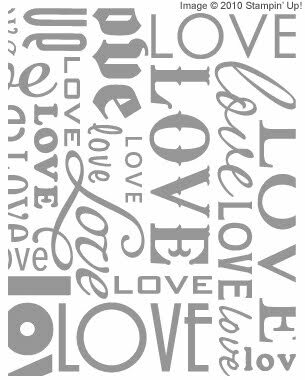 And, to top it all off, the Filled With Love stamp set coordinates with the Lots of Love letterpress plate (plate image shown below). The letterpress plate lets you add a debossed look to your projects--you will need the Big Shot machine to use the letterpress plates, and the impressions are quite striking on Watercolor Paper. Craft inks work best if you'd like to add color to the impression, and Craft Ink Spots are ideal for highlighting small sections of the plate, and/or adding multiple colors. Ordering information for bundles in each available language is pictured below (please click on image below for a larger view you can read clearly). Please note that you can purchase the Love Patterns Designer Series Paper separately, but the FREE Bitty Buttons come only with the purchase of a BUNDLE. 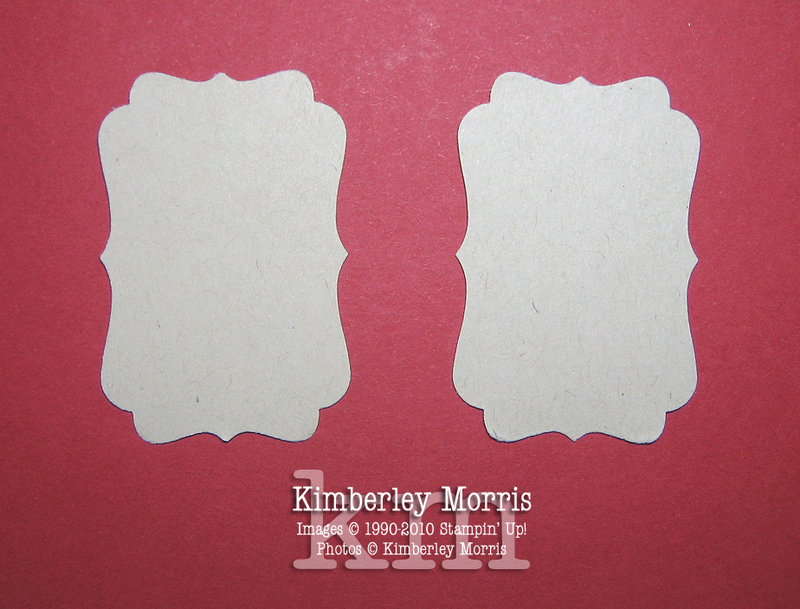 REMEMBER: If you choose a clear mount stamp set, be sure to order clear acrylic blocks. Acrylic Block D is the size you will need, if you only want to order one block that will work for all the images in the set. You can order any of these items through my ONLINE STORE and have them delivered directly to your door, or feel free to contact me if you have questions, or would like recommendations or help with your order, or if you'd simply like to talk to a human to place your order! 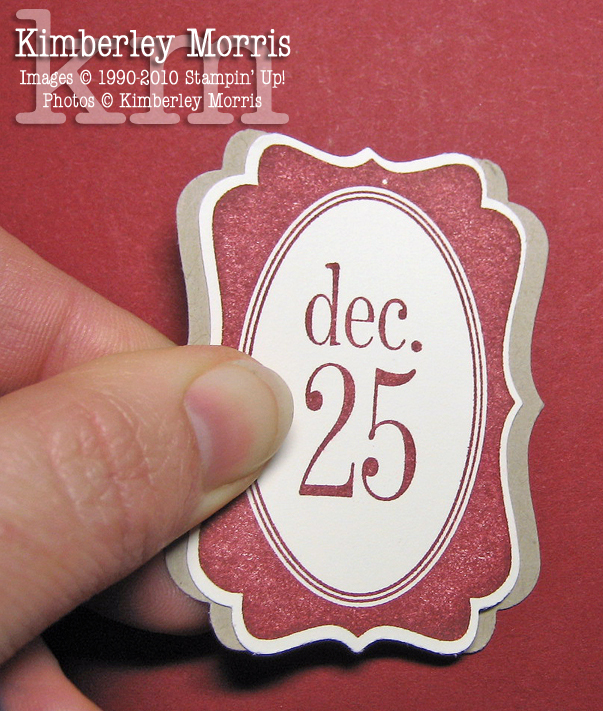 I know these greetings are not "real early", but the card incorporates the colors Real Red and Early Espresso, and we procrastistampers have to take credit at every opportunity we can, to claim to be "real early"! 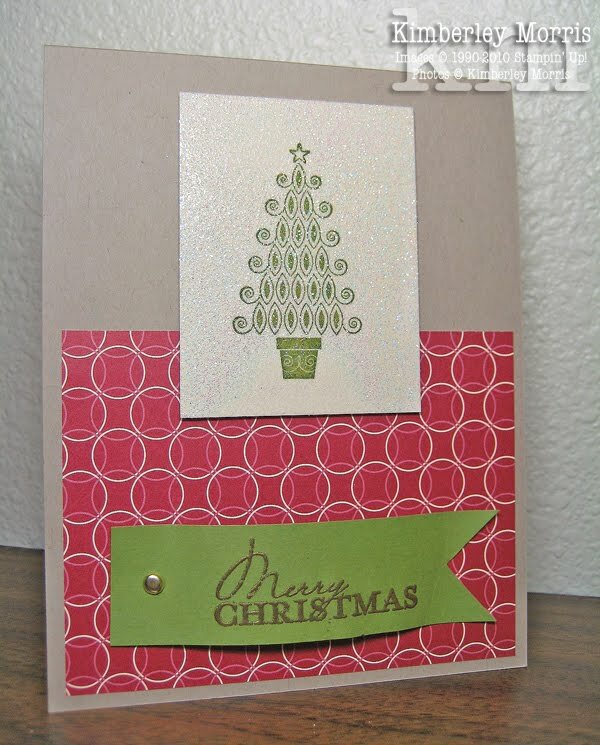 This card uses the Punch Pals stamp set. 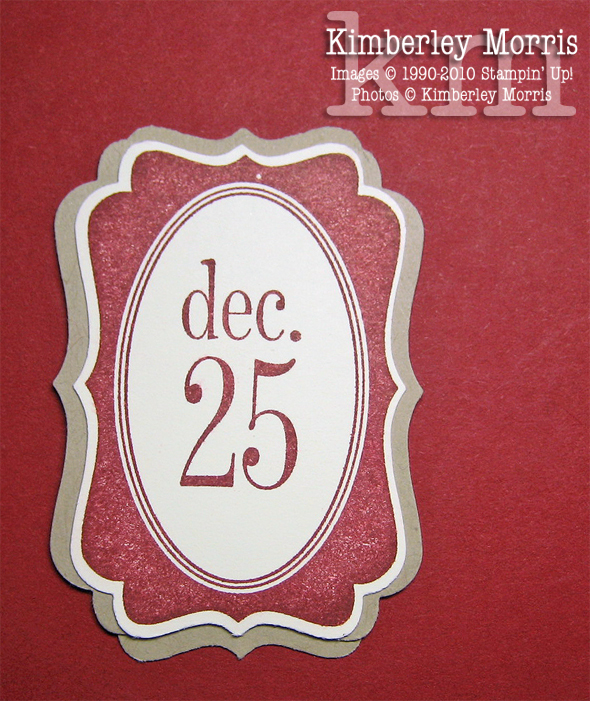 I have WAY too many Christmas/Holiday stamp sets because Stampin' Up! always comes out with such cute ones! I really super try not to buy more than like one a year, because I can only use them for about a month (which for procrastistampers equates to maybe two weeks at the most!). Since I tend to use the most recent holiday sets I've gotten, I wanted to make a point to bring Punch Pals back out again. I love, love, love the snowman and the penguin! Of course, the saying comes from the Curly Cute stamp set, which was new in July...so I didn't go totally "retro" with my card. And I have to be honest, I probably would have preferred to use Crumb Cake or even Chocolate Chip for the dark layers, but I don't have ribbon in those colors and I was too lazy to dye my white ribbon. Once again, my card design was restricted by my laziness. *sigh* That's also why I didn't color in the images. This was meant to be a quick and easy card. If you ever get a card from me where I cut images out by hand, and/or color in the open line images, or, dare I go there -- heat emboss -- you'll know two things: 1) I love you dearly, and 2) I truly was "real early" because I got to take my own sweet time making your card! Lol. Stampin' Supplies: Punch Pals stamp set, Curly Cute stamp set, Real Red card stock & ink, Early Espresso card stock & ink, Whisper White card stock, Marina Mist ink, Garden Green ink, 1-1/4" Square Punch, 1-3/8" Square Punch, Early Espresso 1/8" Tafetta Ribbon, Perfect Polka Dots embossing folder (used with the Big Shot). FYI: Tomorrow, December 15th, is the last day to order to ensure delivery by Christmas! Check out my ONLINE STORE now, and don't forget to hit the Clearance Rack for up to 80% savings!!! This is basically a rehash of a project I designed a while back--they are great for any occasion, but right now they'd be awesome stocking stuffers, gifts for teachers, and handy treats to keep by the door to hand out to all those delivery people and mail carriers bringing your holiday cards and goodies to you! 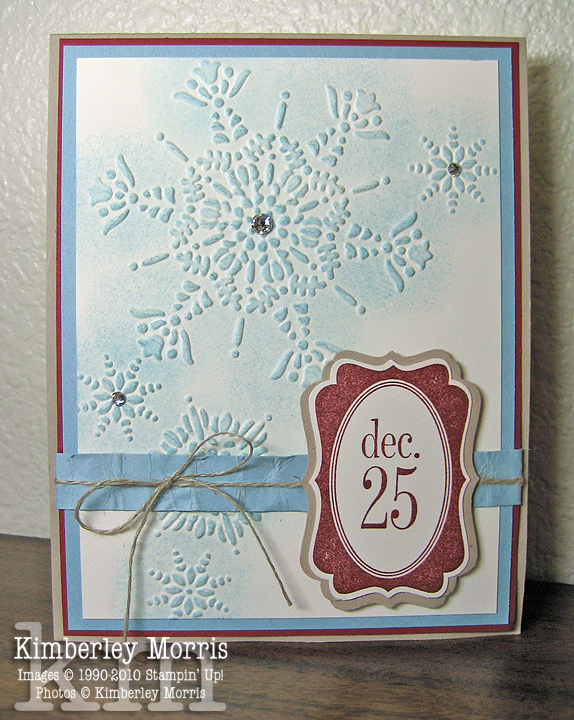 Stampin' Supplies: Simple Snowflake stamp, Jumbo Sassy Sparkles wheel, Marina Mist card stock & ink, Whisper White card stock, Snowflake Punch, 2-3/8 Scallop Circle Punch, Word Window Punch, Perfect Polka Dots Embossing Folder (used with Big Shot), Paper Piercer & Mat Pack (to make hole for Rhinestone Brad), Rhinestone Brad (clear), Crop-a-Dile (to make ribbon holes), White Tafetta Ribbon. 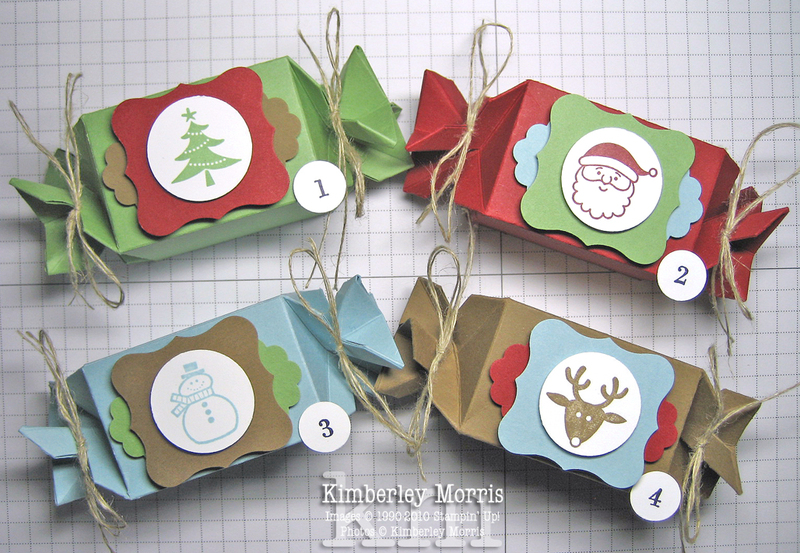 I told you a while back that I would post some info on assembling Advent Candy Wrappers, so here it comes! CLICK HERE to download a PDF Tutorial. String 24 of these together in a garland and hang on a tree, or down a banister. 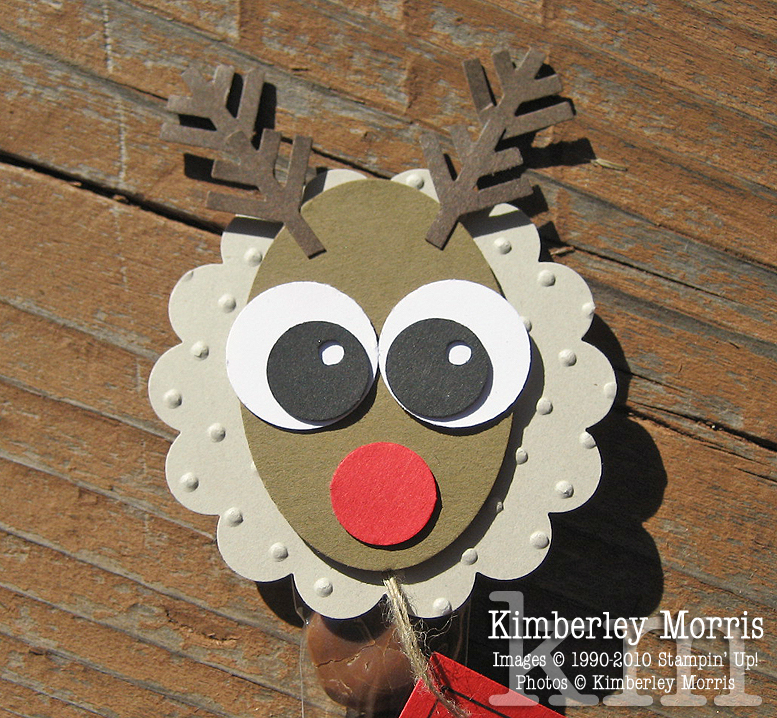 Or, put magnets on the back and display them on a magnetic surface in the shape of a tree or wreath. Or, attach them to another project, like the frame of a Christmas Countdown. Put treats in them, and/or little gifts or scripture verses for each day. They are reusable, and they store flat, so once you've made them, they'll be around for a while. Be Warned: when your kids see these they might force you to make a separate set for each of them!!! Seriously, my son is 17 and not at all into my paper crafting, but he thinks these are SO cool. 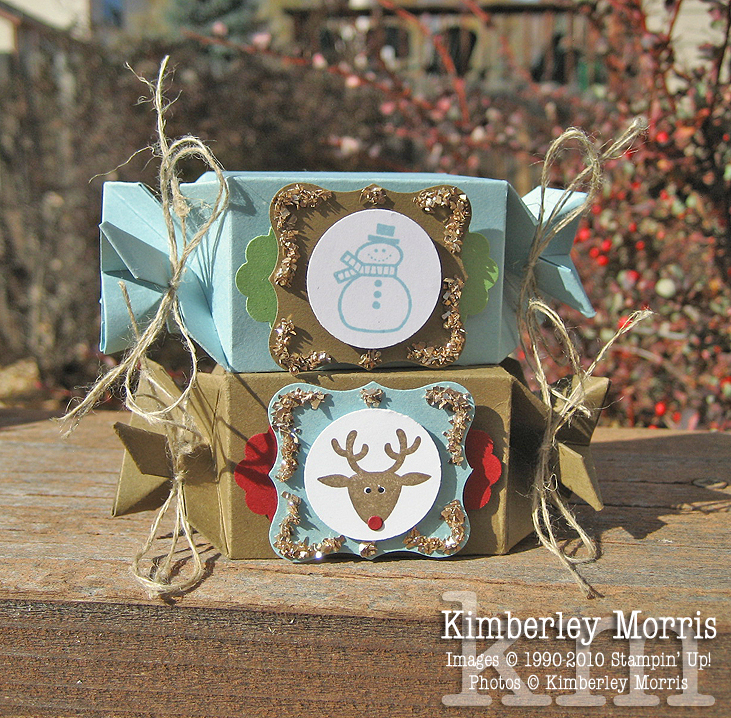 Here is another shot of the Advent Candy Wrappers, without numbers, and blinged up a bit as favors. FYI: Tonight is the last night to Become a Stampin' Up! Demonstrator (enter my Recruiter Authorization Password: newdemonstrator) and get your Starter Kit at 50% OFF! That's only $87.50 for over $310 worth of stuff--even if you're just buying it to make holiday cards and projects, or as a crafting gift, it's an absolute STEAL. Tonight is also the last night to Shop the Online Spectacular and enjoy up to 50% OFF and qualify for FREE SHIPPING. The deadline is 11:50pm Mountain Time. Sorry my posting seems so sporadic...I've been getting distracted with pesky stuff that I must do, but that I really don't want to do, and it gets a little overwhelming at times. Anyway, I made these cards a few weeks ago and totally forgot to take and post pictures. I realized I have a number of projects I've made and haven't yet posted, so I'll try to catch up so you can use the ideas for the holiday season. Oh yeah, and you'll get a special treat from me if you're the first person to correctly guess why my sample table is covered with aluminum foil! Leave your guess in a comment, and don't forget to include your email address within the comment field--otherwise I won't be able to contact you. I'll post the winner as soon as we have one! 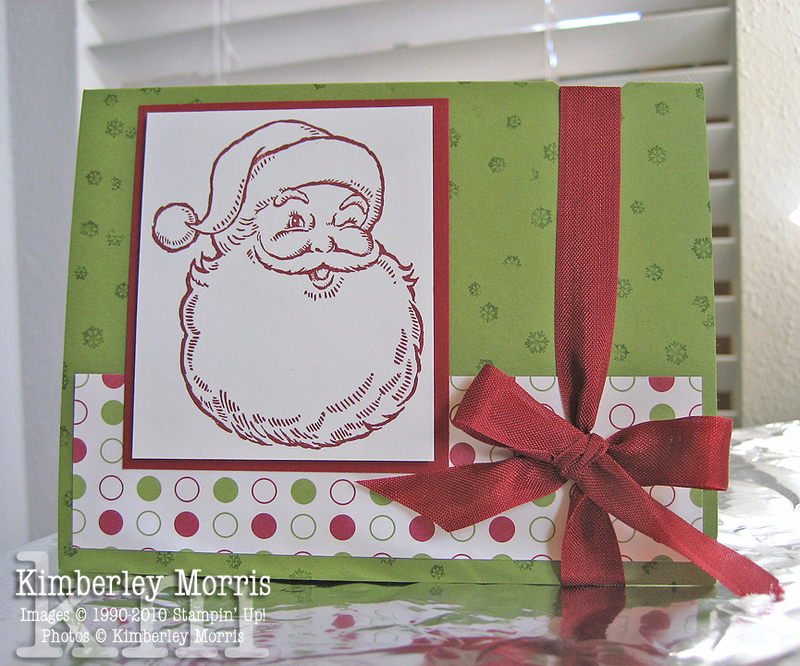 Stampin' Supplies: Jolly Old St. Nick stamp set, Jolly Holiday Designer Series Paper, Whisper White card stock, Very Vanilla card stock, Basic Black ink (waterproof), Cherry Cobbler card stock & ink, Old Olive card stock & ink, Sahara Sand marker, Basic Gray marker, Cherry Cobbler marker, Soft Suede marker, Pink Pirouette marker (cheeks), Blender Pen, Two Way Glue Pen, Dazzling Diamonds Glitter, Stampin' Sponge, Modern Label Punch, Decorative Label Punch, Small Oval Punch, Scallop Oval Punch, Very Vanilla 5/8" Grosgrain Ribbon, White Gel Pen, Cherry Cobbler Seam Binding Ribbon. 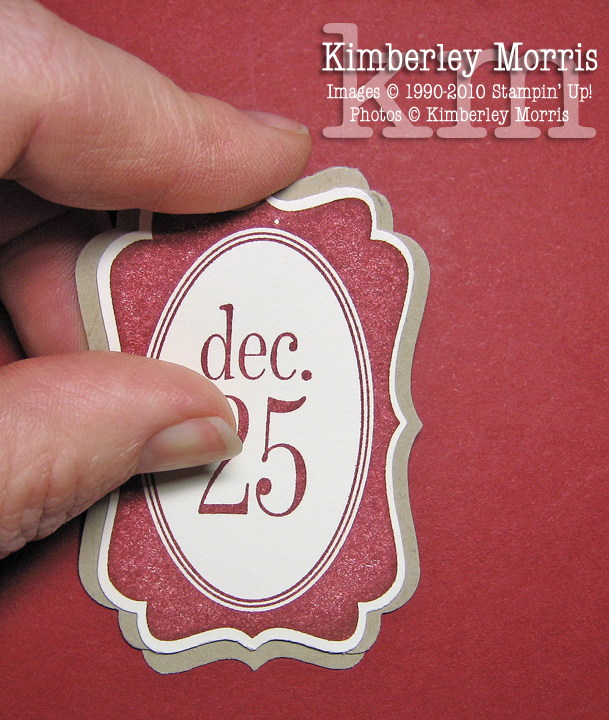 Both the "dec. 25" stamped layer, and the surrounding Crumb Cake layer use the same Decorative Label Punch. I've seen this done other ways, but I prefer to do it my way because I don't like having spaces, or overlapping bumps, and I don't have to cut at precise angles with my method! The first thing I did was stamp the image I wanted, and then I punched it out with the Decorative Label Punch. 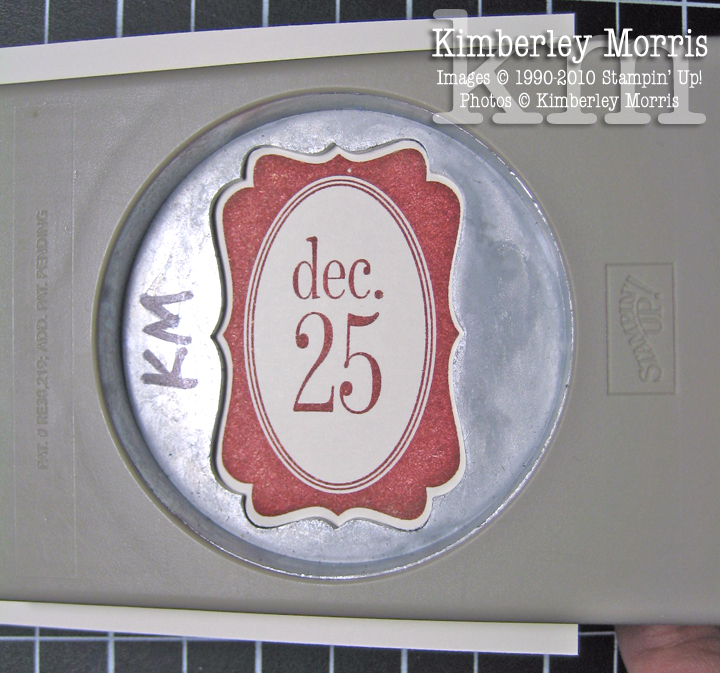 To get the layers, punch two more of the Decorative Label Punch out of coordinating card stock. 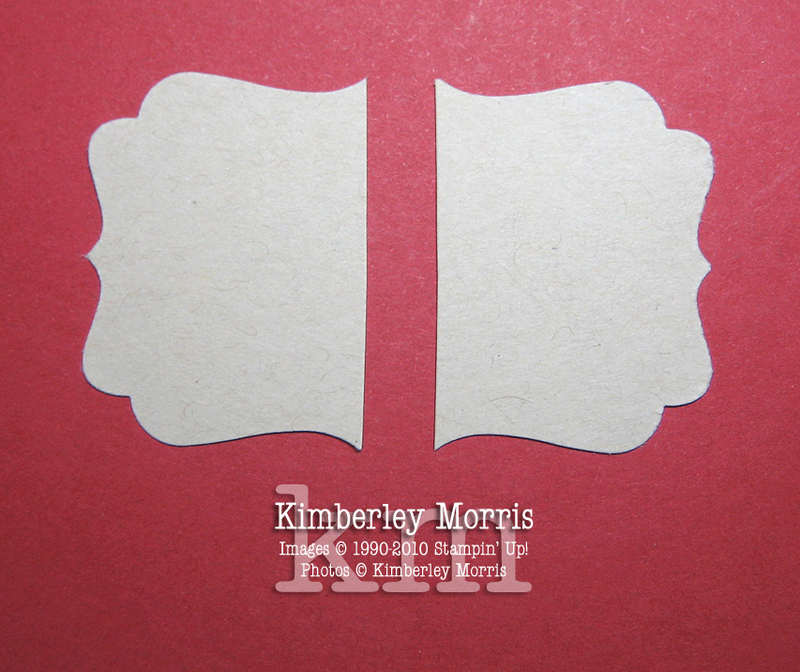 Cut each of the two labels in half, one of them lengthwise, the other widthwise. Check out the pictures below to see what I mean. 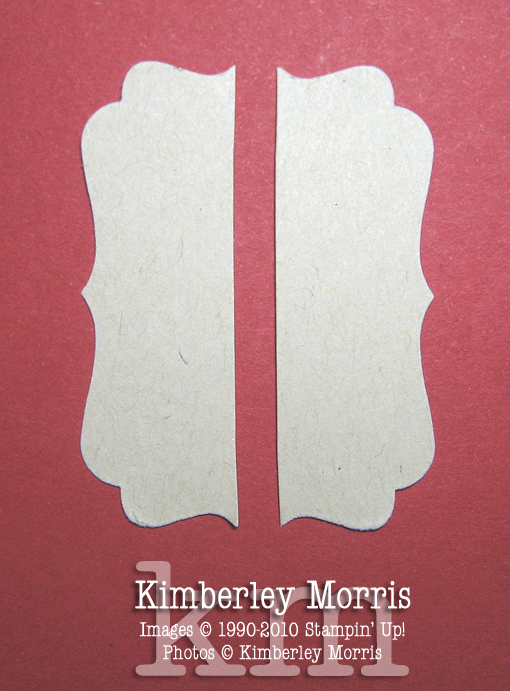 On the long pieces, trim away the little pointy tips from each end. 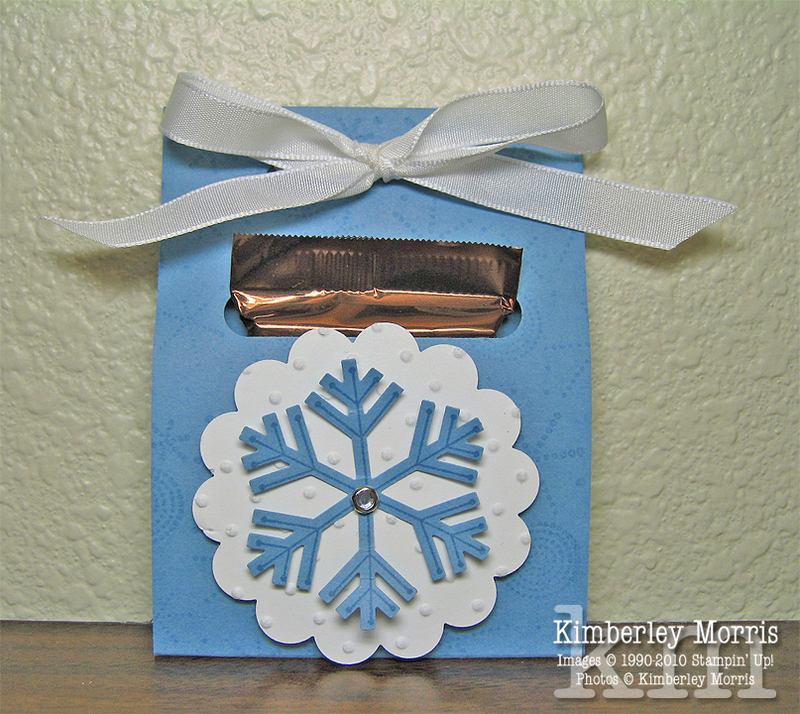 This will keep them from sticking out from under the backing layer. On the shorter pieces, trim away each side. This will rid you of bulky overlapping bumps. Again, see the pictures below to see what I mean. 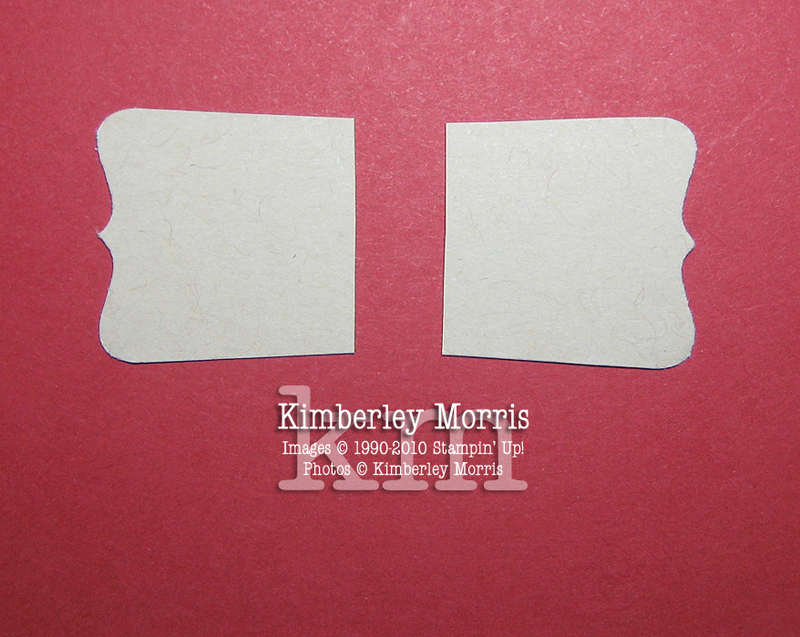 Put adhesive on the back of the stamped and punched label, then turn over the stamped piece so that it's face up, and line up each long side over each of the long pieces of the backing layer as shown below. Finally, put a little adhesive on each short end of the back of the stamped and punched label. Then turn the piece back over so that it is again face up, and line up over the shorter pieces of the backing layer on the top and bottom. Once you get the concept, it's super fast and easy, and you end up with a fashionable layered look. Stampin' Supplies: Tags Til Christmas Bundle (Tags Til Christmas stamp set + Decorative Label Punch), Crumb Cake card stock, Very Vanilla card stock, Baja Breeze card stock & ink, Cherry Cobbler card stock & ink, Northern Flurry embossing folder (used with Big Shot), Stampin' Sponge, Basic Rhinestone Jewels, Stampin' Dimensionals, Linen Thread. Stampin' Up! Black Friday, Cyber Monday & Beyond! If you're making a list of shopping for next week, or even through the end of November, be sure to check out my ONLINE STORE from November 22nd through November 30th for the Stampin' Up! Online Spectacular. • FREE SHIPPING for online orders of $150 or more! Plus, remember that the Handmade Holidays promotion also runs concurrently, so you can pick up some bundles at 20% off and cash in on more savings with the FREE SHIPPING offer! And if you'd like to Become a Stampin' Up! Demonstrator for 50% Off, you can still take advantage of the Online Spectacular savings through FREE SHIPPING on your demonstrator order! Want Free Stamps PLUS 20% Off? Wow, this is an unprecedented opportunity...you can order a Stampin' Up! Starter Kit (choose from two) for half price! Among other things, you get in the Standard Starter Kit: 4 stamps or stamp sets of your own choice (including your choice of wood or clear mount), 1 standard stamp wheel (image your choice) with handle + cartridge + reinker (your choice of color), 4 ink pads, 2 markers, 2 packages of card stock, a stack of patterned paper (all paper and ink your choice of colors), SNAIL and Stampin' Dimensionals adhesives, ribbon (of your choice), a Stampin' Sponge, a Blender Pen, and a Stampin' Scrub stamp cleanup pad with a bottle of Stampin' Mist! You'll even get to choose a Décor Element, and get an applicator tool in the kit. You could make Thanksgiving table favors, your holiday cards, some Valentine cards and treats, and so much more with OVER $310 IN CRAFTING AND BUSINESS SUPPLIES FOR ONLY $87.50! You can get ALL the merchandise mentioned above when you order the Standard Starter Kit, PLUS enough business supplies to do at least 10 workshops, if you want to earn back the cost of your Starter Kit, and/or support your hobby, or develop a part-time or full-time career! 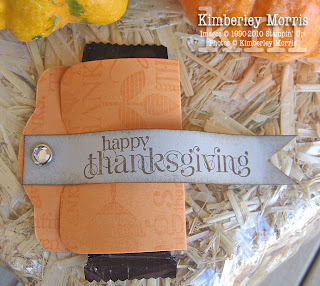 And, when you buy the Starter Kit you become a Stampin' Up! Demonstrator with no obligation to spend a penny more, ever. 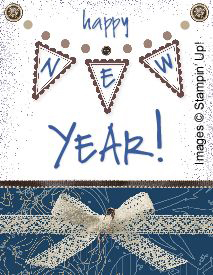 But, if you decide you want more great deals on Stampin' Up! merchandise, you always get at least 20% OFF as an active demonstrator! 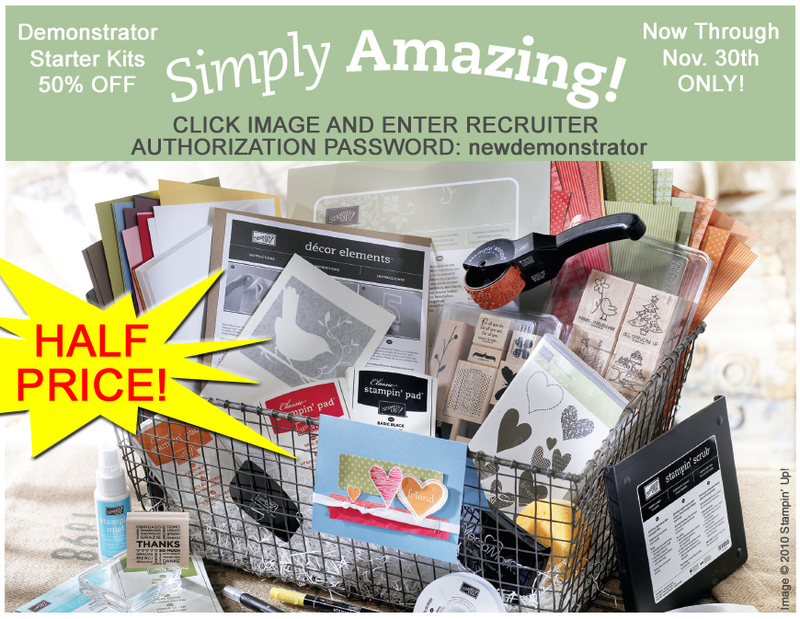 I have to tell you, THIS OFFER IS ONLY AVAILABLE THROUGH NOVEMBER 30TH and I have never seen any Stampin' Up! opportunity as amazing as this, in all my 16+ years with this company! Share what you love, and make new and lasting friendships...and even earn money while you're doing it! Enjoy access to Stampin' Connection, a demonstrator-only web site full of nearly unlimited creative ideas! 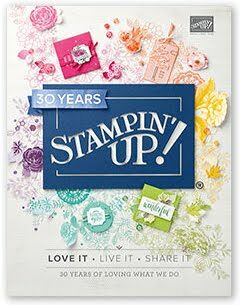 Receive a free monthly Stampin' Up! full-color newsletter exclusively for demonstrators, with TONS of business and crafting ideas, tips, and training. Receive two free months subscription to your own Demonstrator Business Web Site, where you can receive online orders anytime, 24/7!!! Have the opportunity to earn free merchandise, and incentive trips! Please feel free to email me or call/text me at 719-205-5957 with your Starter Kit and Stampin' Up! questions. I'm always here and happy to help! 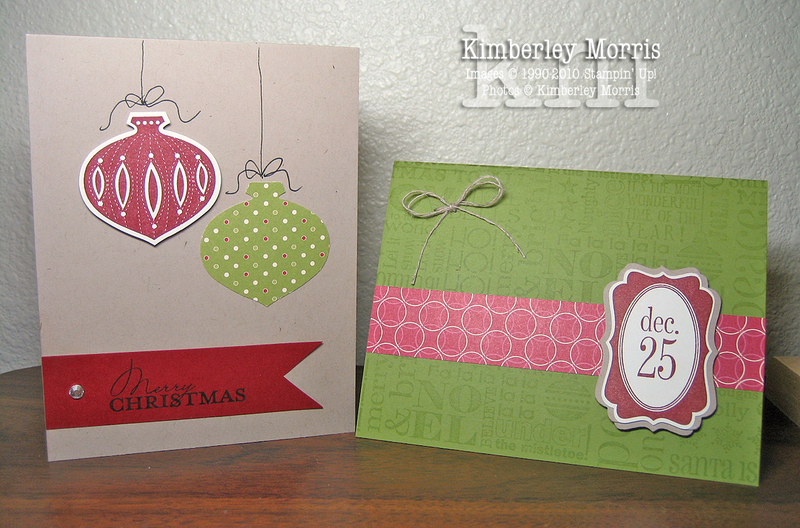 Just wanted to share another couple of cards we made yesterday at my Stampin' Mondays event. These are also the two cards we made at Beth's workshop last week! They feature items in two of the Handmade Holidays promotional bundles--you can get them at 20% OFF through December 16th! I did make some slight changes to the ornament card after taking the picture above, and before the events...so the card below is the card guests actually made. 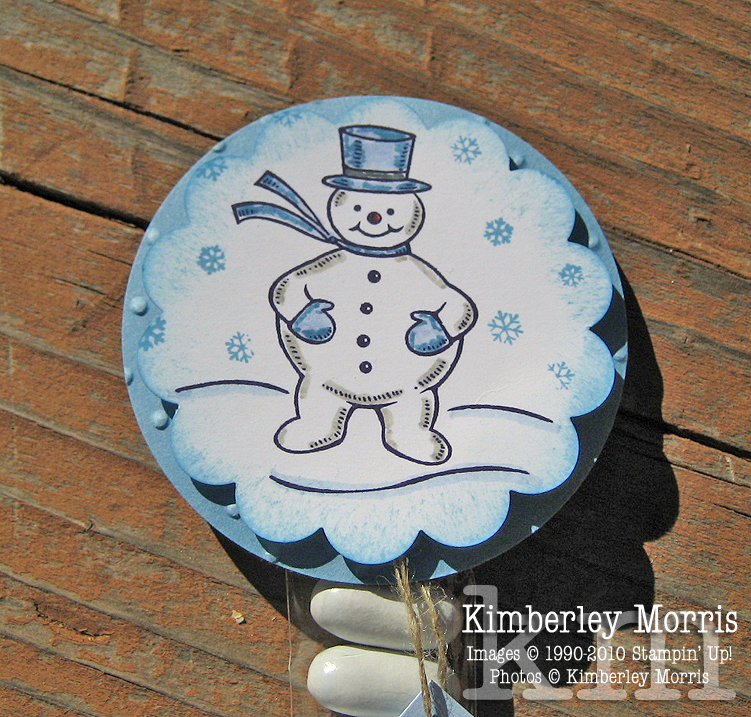 I like it a lot better--there is a subtle background, and I turned the Designer Series Paper around so the pattern on the ornament punch is a little brighter. Stampin' Supplies: Contempo Christmas stamp set & Jolly Holiday DSP (Contempo Christmas Card Bundle), Sassy Sparkles Jumbo Wheel, VersaMark pad, Cherry Cobbler card stock, Cherry Cobbler ink pad, Crumb Cake card stock, Very Vanilla card stock, Black marker, Basic Rhinestone Jewel Accents, Ornament Punch, Tags Til Christmas stamp set & Decorative Label Punch (Tags Til Christmas Bundle 1), Jolly Jingles Jumbo Wheel, Stampin' Around Jumbo Handle, Mat Pack, Paper Piercer, Linen Thread. Welcome to my Castle on the Royal Blog Tour running November 5th through November 8th, 2010! 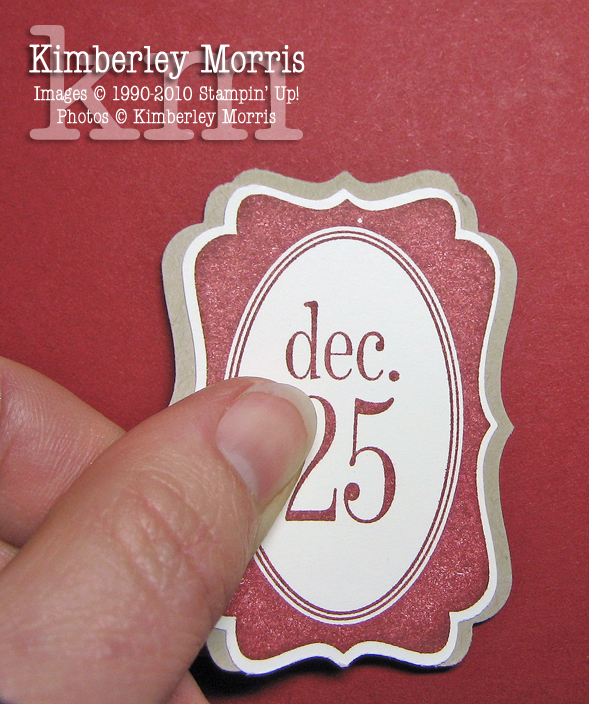 The stamp set I am featuring this blog tour is Jolly Bingo Bits, from the Holiday Mini Catalog. 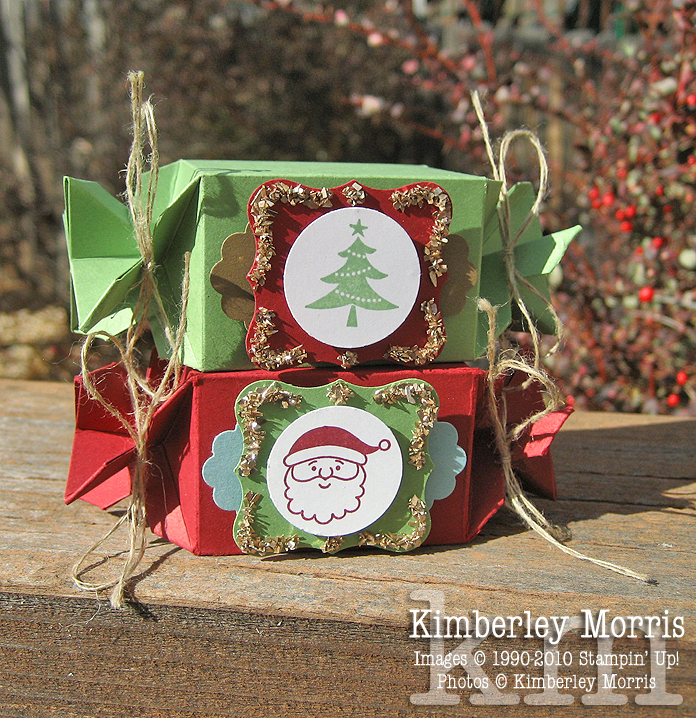 My first project is a set of Candy Wrapper Advent Boxes, which Jolly Bingo Bits is just perfect for, since there are 24 different holiday images in there! You could put velcro on the back of each one and put them around a Christmas Countdown frame, and/or put numbers on them to count up to Christmas Day. Make sure you scroll down through the projects to enter my BLOG CANDY GIVEAWAY at the end! 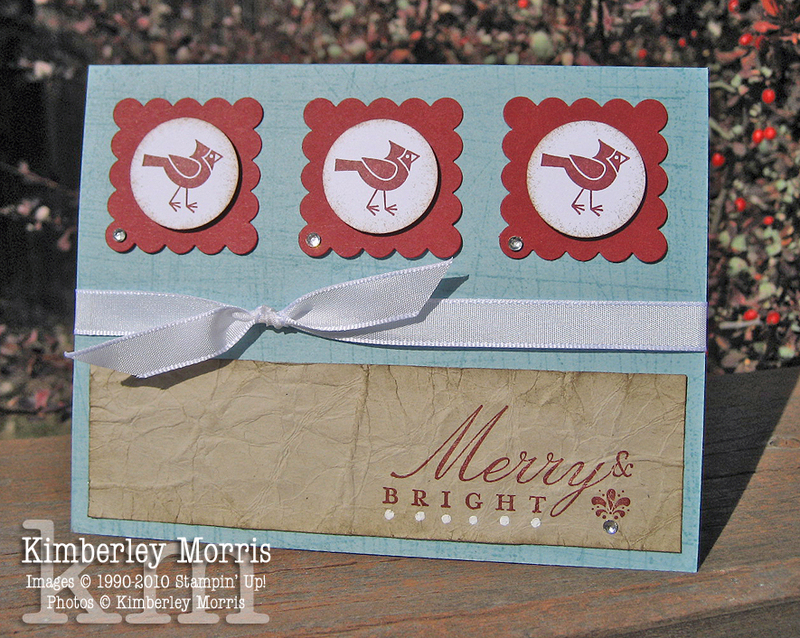 And now I have a few simple cards for you featuring the Jolly Bingo Bits stamp set. You'll notice I'm sticking close to the same color scheme throughout my projects. I did add some Crumb Cake card stock to the mix because its neutrality works with almost any layout where you want to add depth and an earthy, warm feel. Also notice how the Glass Glitter and the Rhinestone Jewels really give these projects a festive sparkle! They both are definite must-haves for holiday crafting. I added sayings from the Bright Christmas stamp set to each of these three cards. 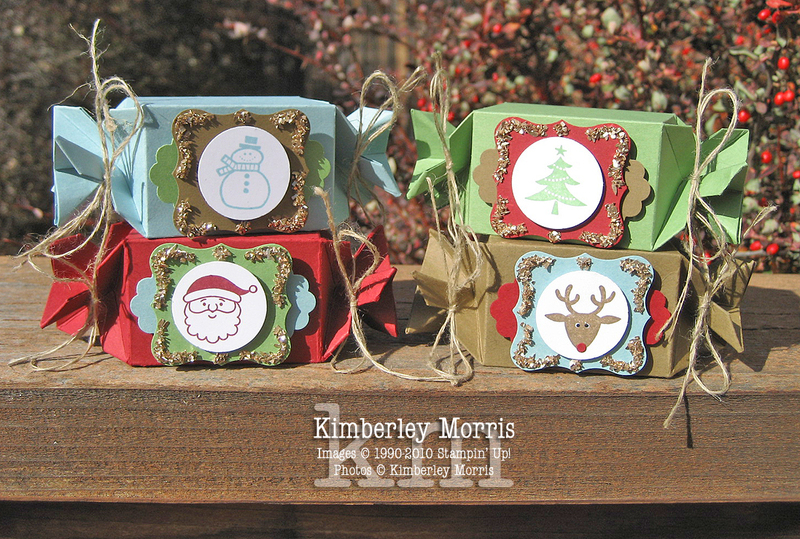 This stamp set can also be found in the Holiday Mini Catalog, and is versatile throughout the winter because only one of the three sayings actually mentions Christmas. Wow, check out the pretty, full bow that Cherry Cobbler Seam Binding makes on the wreath! I just stamped the holly image, and the wreath image, from the Jolly Bingo Bits stamp set in a circle for the focal point of this card. The Glass Glitter border was a last minute afterthought, but it really takes the card up a notch. 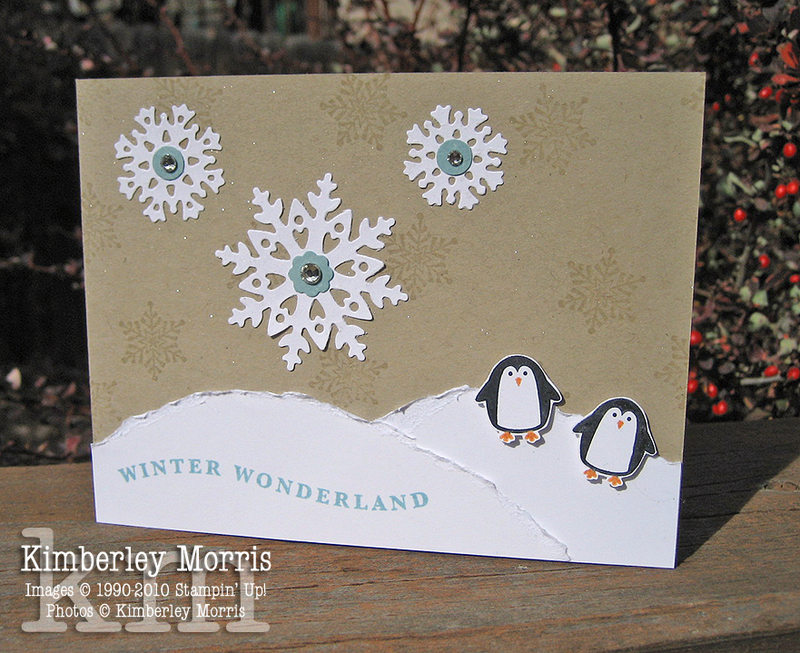 I could not feature this set without using the penguins--they are SO darling! I did sneak in some more colors by using a couple of markers on the penguins: Basic Black and Pumpkin Pie. Can you see how the top background of the penguin card sparkles? I sprayed that with Shimmer Mist (Champagne Mist Shimmer Paint mixed with alcohol in a spray bottle)...which I love because I have an awful time and make a terrible mess with loose ultrafine glitter. 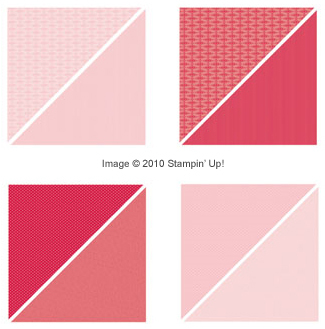 2) Indicate in your email whether or not you are a Stampin' Up! 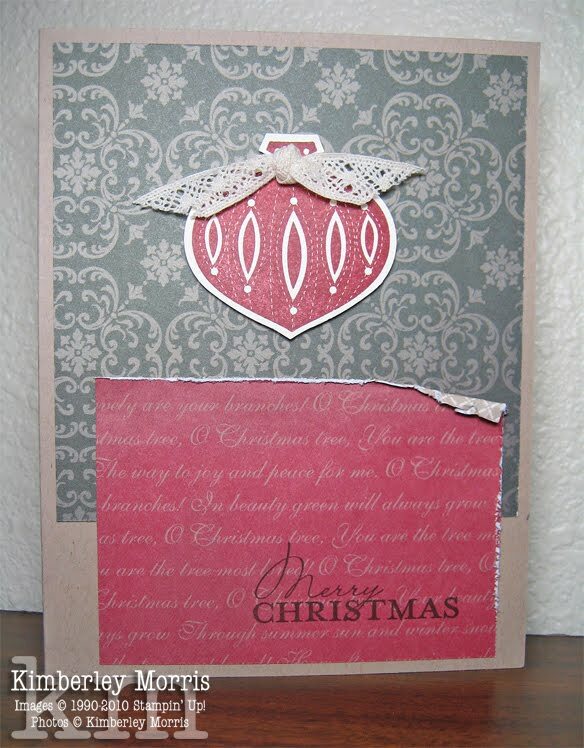 Customer/Fan, or Stampin' Up! Demonstrator. 3) One entry per name, email address, or household, please. Any entries not meeting all requirements will be disqualified. Offer valid only in the U.S.
UPDATE: COMMENTS AND BLOG CANDY CONTEST ARE NOW CLOSED--THANK YOU! See THIS POST for more "poop" ideas, and to download PDF files to print out the tags from your own computer. 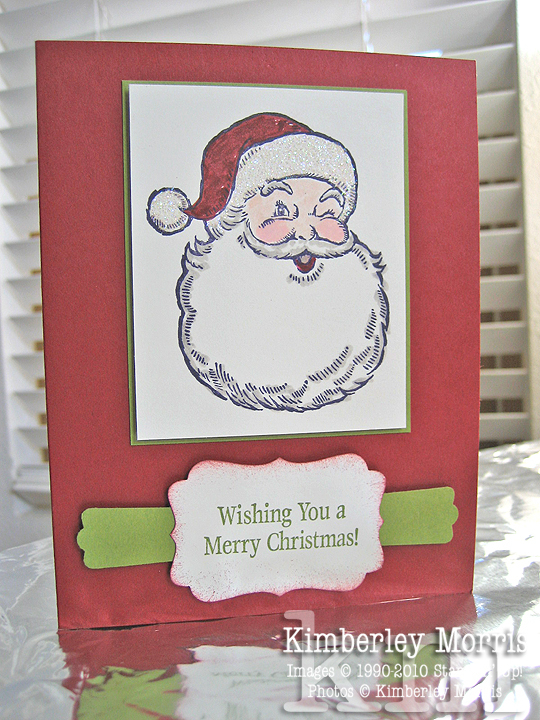 Stampin' Supplies: Jolly Old Saint Nick stamp set, Whisper White card stock, Marina Mist card stock, Bashful Blue card stock, Basic Black ink, Bashful Blue marker, Marina Mist marker, Sahara Sand card stock, Soft Suede card stock, Real Red card stock, Basic Black card stock, 2-1/2" Circle Punch, 2-3/8" Scallop Circle Punch, Perfect Polka Dots Embossing Folder, Wide Oval Punch, Snowflake Punch, 3/4" Circle Punch, 1/2" Circle Punch, 1/8" Circle Punch (Crop-a-Dile), 1/16" Circle Punch, Linen Thread. They're both very simple projects that you could bling the daylights out of if you wanted, but I like fast and easy for my Stampin' Mondays. The one at the top is a standard sized card, and the one on the bottom is making use of some little snack size Hershey bars leftover from trick-or-treaters last night! I always try to buy treats I know I can make cute favors with...though I have to hide the candy from the rest of the family or it disappears. Stampin' Supplies: Thankful For stamp set, Soft Suede card stock and ink, Sahara Sand card stock, Bright Blessings Jumbo Wheel, VersaMark ink pad and marker, Peach Parfait card stock, Pear Pizzazz card stock, Pumpkin Pie ink, Old Olive ink, Stampin' Sponge, Wide Oval Punch, Modern Label Punch, Two-Step Bird Punch, Flower Brads (Brights-Pumpkin Pie), Rhinestone Brads (Clear-Large), 1/8" Punch, Two Tagz Die, Stampin' Dimensionals. To see all the bundles, please check out my PREVIOUS POST. View or download flyer with ordering options and pricing HERE. For your convenience, pictures of products and sample projects are listed below. PLEASE NOTE: final project shown for representative purposes only, and may require more supplies than are included in its respective bundle. Please contact me prior to your order to ensure you get everything you need for your desired projects.